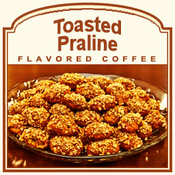 Toasted Praline is a delicious flavored coffee � perfect for those that love the flavor of sweet confections such as pralines. Pralines are popular in the South for their nutty flavors that melt away the minute these holiday favorites hit your taste buds. With a roasted undertone, this Toasted Praline flavored coffee will hit the spot with its full flavor of roasted pecans and pinch of sugar. Made with 100% authentic Arabica beans, this gourmet coffee has only 2 calories in each cup � making it an indulgent and guilt-free treat. Roasted and shipped on the same day, the Toasted Praline flavored coffee will be sent in a heat-sealed valve bag. 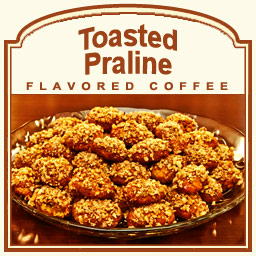 This Toasted Praline flavored coffee will make a delicious iced beverage or a piping hot cup of joe to start the morning off right.